This Day of the Dead wedding diorama shows a miniature skeleton bride and groom with their dog encased behind glass. 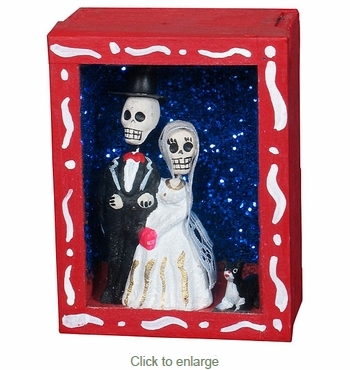 The bride and groom skeleton scenes are created with clay and hand painted by Mexican folk artists. They are encased in a wooden painted box with a glass cover. Measurements are approximate and exact detail of each may vary.